President Obama won Virginia and Florida among the Southern swing states. He lost North Carolina. What was the difference? North Carolina had more rural and exurban voters. There were three Southern states among the nine considered “swing states” in this election: Virginia, North Carolina and Florida. President Obama won Florida and Virginia. Obama lost North Carolina because the rural and exurban vote in that state is larger than in the other two southern swing states. 1. Exurban voters are more stalwart supporters of the GOP than rural voters. Exurban counties, remember, are part of metropolitan regions — they are technically “urban” counties — but we separate them into their own category because about half the people in those counties live in rural settings. 2. The gap between the cities and rural areas is wide and widening in the South. Take Virginia. There is nearly a 20 point gap between the parties in rural and exurban counties. The gap is slightly larger in exurban counties. And the gap widened between 2008 and 2012. President Obama won 42.9 percent of the rural vote in 2008, but only 39.9 percent in 2012. In all of these states, Obama’s vote totals are lower than they were in 2008 and Romney’s vote was higher than what John McCain won four years ago. The margins closed in all of these states, leading to Romney’s win in North Carolina. Obama’s rural vote percentages were highest in North Carolina, which he won. (He got 41.6 percent of the rural vote in Carolina.) 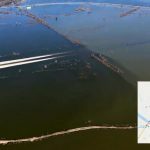 His rural vote percentage was the smallest in Florida, at 35.9 percent. Romney benefited because the rural and exurban vote in North Carolina accounts for nearly 47 percent of the total vote. Rural votes alone made up almost 28 percent of the total vote in North Carolina. The rural and exurban vote account for only 19 percent of the vote in Florida and 26 percent of the vote in Virginia. 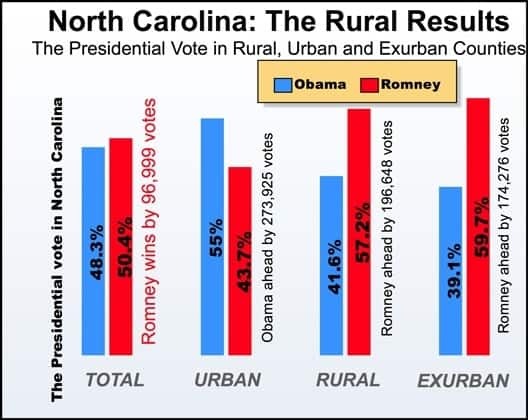 The story in North Carolina is what when the rural and exurban vote gets large enough, Obama had a hard time winning. The gap between urban counties and rural counties in Florida is astounding. The Democrat won Florida’s cities by 3 points. He lost the rural counties by more than 27 points. Here is the chart for Florida.